For over 100 years, the Wegis and Young families have been pillars of the Kern County agriculture industry and community. The business was born in the 1890s when four brothers from Germany began farming 20 acres of land. Today, Wegis & Young is operated by the third and fourth generation of the families and encompasses 10,000 acres of farmland across Kern County. Over the years, Wegis & Young has grown pretty much everything. From row crops to rice, the farms have changed as the agriculture industry in California has changed. 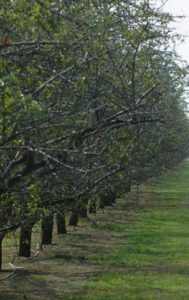 Today, operations have shifted to tree nuts such as almonds and pistachios, but a large amount of land remains diversified in a variety of commodity crops including, tomatoes, alfalfa, wheat, dates, table grapes, and corn. Wegis & Young also manages a 6,000 acre dairy farm. In recent years, Wegis & Young has expanded their business operations to include Water Associates, an irrigation consulting operation. Greg Wegis, one of the operation’s partners and farmers, graduated from Cal Poly in 2000 and returned to help the farm branch out into other avenues like Water Associates, which deals, rents, and installs top tier diesel and electric engines for agricultural irrigation and municipal use, as well as designing and building filtration systems. Greg and his partners have also started REDtrac, a software that provides farmers and clients with personal asset management and GPS tracking for systems like soil moisture sensors. These other avenues and collaborations have been mutually beneficial and have increased efficiency and sustainability on Wegis & Youngoperations. Through Greg’s involvement in the agricultural community, including serving as the President of the Kern County Farm Bureau, and his continued sustainability efforts, has made the Wegis & Young operation a model for agricultural efficiency. One of the most important advancements on the Wegis & Young farm has been the implementation of 42 soil moisture sensors through REDtrac. These sensors actually send digital soil moisture tests every 15 minutes to computers and mobile devices. Through these reports, Greg says they can adjust their irrigation accordingly. They also use soil moisture sensors and a weather station that monitors ET, which also aids in irrigation management. Today 100% of Wegis & Young tree crops are on drip irrigation, along with 250 acres of tomatoes. These drip irrigation systems are powered by Water Associates irrigation engines, which have contributed to energy conservation and air quality improvements as either electric or top-tier diesel engines. These engines allow for a high level of water efficiency by controlling pressure and flow through variable speed pumps for water application. These advanced engines also allow Greg and his fellow partners to download individualized reports and information on each engine’s air emissions and make management adjustments if necessary. In order to continue to lower air emissions, Wegis & Young has taken additional steps beyond efficient engines, including only operating low dust harvesters and applying road oil to reduce dust from machinery and farm vehicles. In terms of energy conservation, Greg notes that this year, the farm will be working to implement 3 solar projects that will also aid in supplying power for irrigation. In addition to energy conservation and irrigation efficiency, Wegis & Young have proven dedication to soil health. Wegis & Young amend their fields with gypsum and add compost to their row crops. Greg includes that the operation actually applies ground-up wallboards sourced from housing developments. These wallboards are 100% gypsum and divert waste from landfills. These actions to improve soil health, along with their water and energy management decisions prove that sustainable practices on a large scale operation are practical. Although Greg and his partners have implemented countless sustainable efforts, their operations have faced challenges in executing these management practices. 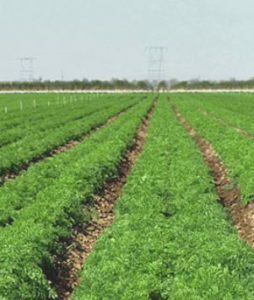 First Greg notes that, although Wegis & Young has moved to drip irrigation in most of their crops, including trees, tomatoes, and alfalfa. However, moving to drip in some crops, like corn, is difficult so they have had to remain on furrow irrigation due to planting and harvesting constraints. The drought has also increased salinity concentration in the soil. Due to less rainfall and availability of water, leaching salts is not always a realistic solution. Greg continues that water availability is also difficult in that they try to use only surface water for irrigation and well-water as a last resort, but again this has become difficult during the drought. As well as issues pertaining to water and irrigation, Greg Wegis discusses that food safety is very important to Wegis & Young. Greg would like to apply compost for their trees, but it is difficult to ensure that compost prepared from manure and food waste is safe on their large scale operation. Greg also notes that growing organic almonds and pistachios raises issues when produced on a large scale. However, Wegis & Young are currently growing organic dates in Coachella Valley and organic almonds for the first time this year. Although Wegis and Young continue to face many complex problems, from irrigation to compost, Greg says there are always going to be challenges, but Wegis & Young is always working to find solutions for these problems.